Natural law theory is enjoying a revival of interest in a variety of scholarly disciplines including law, philosophy, political science, and theology and religious studies. 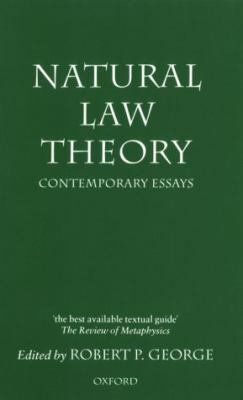 This volume presents twelve original essays by leading natural law theorists and their critics. The contributors discuss natural law theories of morality, law and legal reasoning, politics, and the rule of law. Readers get a clear sense of the wide diversity of viewpoints represented among contemporary theorists, and an opportunity to evaluate the arguments and counterarguments exchanged in the current debates between natural law theorists and their critics. Contributors include Hadley Arkes, Joseph M. Boyle, Jr., John Finnis, Robert P. George, Russell Hittinger, Neil MacCormick, Michael Moore, Jeffrey Stout, Joseph Raz, Jeremy Waldron, Lloyd Weinreb, and Ernest Weinrib.George, Robert P. is the author of 'Natural Law Theory Contemporary Essays', published 1994 under ISBN 9780198235521 and ISBN 0198235526. Loading marketplace prices 57 copies from $15.66 How does the rental process work?